David Snyder started drawing cars, airplanes and trains at the age of six. His passion for transportation history continues today. David graduated from Central Academy of Commercial Art in Cincinnati, Ohio. A successful career in advertising as a designer, art director and illustrator left him yearning to paint the transportation history he remembered from his youth. The artistry of the automobile never escaped his attention. 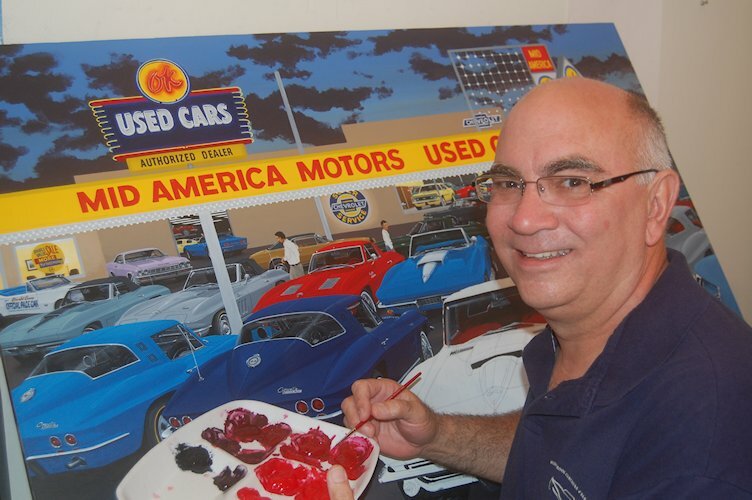 David's art portrays memories of growing up with cars from the '50's through the American Muscle era. He takes you down memory lane inviting you to "step right in" to his paintings and visit the past. The period architecture, signage, oil cans in the garage bay - no detail is too small-are all a part of his passion. Known for fidelity of detail he spends countless hours on research before beginning a painting. He has self-published over 100 limited edition prints; 50 of which are sold out. Snyder's paintings and prints are collected worldwide and has received numerous awards. David was born and raised in Cincinnati, Ohio. He lives in Milford, Ohio with his wife and business partner Marion. They have two daughters and two grandsons who are budding "car guys."